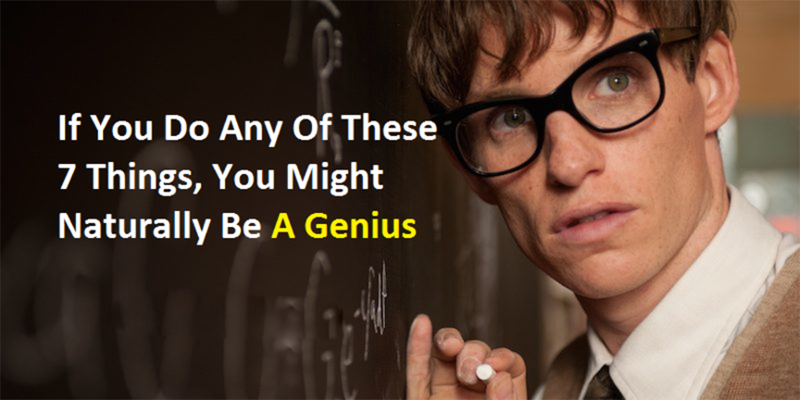 Did you know you really might be a genius? It's true. Even if you don't think of yourself as intellectually superior, you could possess many of the characteristics shared by people of high intelligence. It turns out many people who are geniuses have personality traits, habits and behaviors in common. We've all read about the tortured geniuses who use drugs or alcohol to cope. This isn't just a plot device used in dramatic fiction, either. It doesn't take long to create a long mental list of writers, musicians, artists, scientists and other creative geniuses who have succumbed to or struggled with addiction. Some use alcohol or drugs to cope with the difficulties of fitting in. Others use alcohol or drugs because of their desire to have new experiences. You would think geniuses would be full of confidence. After all, they're geniuses. After reading this, you may be thinking that you've tested your IQ and are decidedly not a genius. Think again. First of all, if you've taken one of those free online IQ tests, throw those results out the window. They are absolutely useless. Even if your IQ has been measured professionally, those results don't take into consideration multiple bits of intelligence or possible difficulties with test taking that could skew your results.